Five friends unwittingly make contact with an evil entity named Zozo after using a Ouija board on Halloween night. Home video footage shows friends Monica Olive, Esther Haltom, and Nick Corrado using a Ouija board. After contacting a spirit identifying itself as Zozo, Monica goes into convulsions. Tess writes a letter to reported Zozo survivor Darren Evans. She then recounts her Ouija board experience for Darren. Tess joins her friend Aiden for a Halloween night get-together at Aiden’s father’s island cabin. With them are old friends Nick and Dean, and Dean’s new Wiccan girlfriend Mel. A man named Skip takes them across the water to Paradise Island. The boys settle in as the girls get to know each other while carving a pumpkin. Mel has an asthma attack while telling Tess about a Wiccan holiday that she calls Zoan. The friends discover that the electricity is not working. Nick entertains the group with a card trick before Mel brings out a Ouija board. Mel and Dean use the board while blindfolded, although Dean does not take the séance seriously. Tess transcribes the letters as Mel asks questions to the spirits. After a false start, Tess briefly makes contact with her deceased cousin Adam. The spirit of a boy named Oliver then warns them of a coming danger. A loud bang on the door startles everyone. Aiden investigates, but finds nothing. Mel insists on using the board again. After Mel argues with Dean, Tess takes his place at the board. Aiden replaces Tess as the transcriber. The next spirit threatens and insults Mel. Tess starts asking the questions. The spirit claims that it is Tess’ guardian. Tess believes she contacted her mother, but continued questioning identifies the spirit as Zozo. Zozo threatens to kill them. To prove he is real, Zozo then repeats Nick’s earlier magic trick by making a card disappear and then tells the group that he is in the bathroom. Everyone goes to the downstairs bathroom where Aiden sees something that frightens him. Nick finds a shirt behind the door that he credits for scaring Aiden. Still unable to find the missing card, the friends agree to call it a night. Something unseen attacks Tess while she sleeps. In the morning, Tess recounts her night terror for Mel. She also tells Mel about a paranormal experience suffered by her mother. Tess’ mother had an encounter that paralyzed her and caused her to float along the ceiling until she had a vision of a baby dying in a fire. Tess’ sister later died just three days after being born. Mel admits that she continued playing with the Ouija board after everyone went to sleep. She contacted her cousin Adam again, but strangely, he asked questions about Tess. Aiden guts a fish he caught in the lake and prepares to serve it for dinner. Over dinner, Dean reveals that he became friends with Aiden when Aiden was a paramedic who saved his life. Tess and Nick met at school. Aiden pours everyone some of his grandfather’s homemade vodka and the group begins partying. Tess awakens during the night and sees Mel using the Ouija board alone in front of the fireplace and talking to Adam. Mel claims that Dean passed out and that Nick and Aiden went outside. Tess retrieves Mel’s inhaler from another room and returns to find a jack-o-lantern slashed with a knife. Mel’s blanket is now draped over her like a shroud while she sits. Tess removes the blanket. Mel sits in a trance before erupting into laughter. When Mel has an asthma attack, Tess looks for a second inhaler in the bathroom and becomes locked inside. Mel dies. Tess finds the missing card from the night before in a bathroom vent. Now psychologically broken, Tess finishes recounting the story for Darren Evans. Darren leaves Tess at the Beloit View Psychiatric Hospital where he was visiting her and takes the Ouija board with him. An epilogue reveals that Dean was unable to cope with Mel’s death and committed suicide one year later. 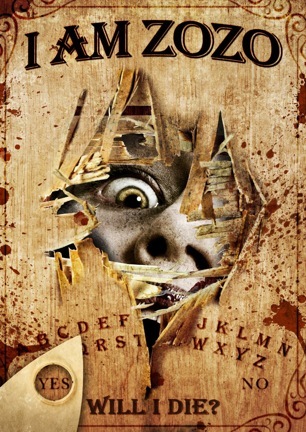 NOTE: "I Am ZoZo" has been retitled "Are You There?" for PAL territories. “I Am ZoZo” purports to be based on a “true story” revolving around something dubbed “The Zozo Phenomenon” in at least one paranormal circle. The claim is that “Zozo” is a malevolent entity contacted by thousands of people over the years through the use of Ouija and spirit boards. Communication with the evil spirit is generally presumed to be a precursor to danger, if not a gruesome fatality. Do a Google search for “Zozo” and the name “Darren Evans” comes up repeatedly. Darren is a collector of Zozo-related stories and is the go-to source for information on Zozo encounters. Reportedly a survivor of nightmarish events involving his own disastrous experiences with the Ouija summoned entity, Darren also appears in “I Am Zozo” playing himself as an expert on the subject. For whatever it may be worth, my own admittedly brief Internet investigation into Zozo failed to find anything mentioning the word Zozo that did not also include a reference to Darren Evans. None of the pages came from a date prior to 2009 either, so draw your own conclusions on how widespread or well known this phenomenon may truly be. Noted demonologist John Zaffis does mention the entity in a recorded radio interview, however. If not for this corroboration, a suspicious mind could wonder if Darren’s Zozo blog was nothing but clandestine movie marketing. “True story” claims aside, “I Am ZoZo” is the tale of five friends who use the Ouija board for entertainment on Halloween night in a remote island cabin lit only by dim flames because the power is out. Factor in that one character is a magician and another is a Wiccan and they are just one Indian burial ground shy of having every element needed for an unmitigated supernatural disaster. As the title would indicate, the group makes contact with Zozo and bad things start to happen. Actually, only one bad thing happens. And that is what hammers the final nail into the movie’s coffin. “I Am ZoZo” is a too tame horror story that develops an occasionally eerie atmosphere, but it never delivers a solid jab, much less a knockout punch. Writer/director Scott Di Lalla has a background as a nonfiction filmmaker, so it is no surprise that the movie’s strengths come from its authentic documentary feel. Shot entirely on Super 8mm film, the handheld camera adds to the home movie quality in a manner that makes the viewer a passive observer of naturally unfolding events. Actors play out scenes in long takes with the sense that the camera just happened to “drop in” and go unnoticed as real people set about their evening. The script requires the island cabin to be without power, allowing flickering jack-o-lanterns and oil lamps to round out the mood. For a setup as generic as five young friends partying the weekend away in a secluded location, the group here is far less obnoxious than what is typically on hand in low-budget horror. Aside from a tiff between the only coupled up pair in the bunch, everyone is surprisingly civil, friendly, and gives the impression of being a believable circle. The newcomer to the group is welcomed with open arms, the host graciously prepares a homemade dinner for everyone, and the montages of drunken revelry set to rock music are reduced to a bare minimum. There are interesting takes on how the Ouija scenes are handled, too. The depiction of the group around the board is untraditional from how such encounters are usually staged. The first two “players” wear blindfolds while another person transcribes the board’s responses. Some questions are outright ignored by the spirits. Some answers are completely ambiguous. False starts and misspellings add to a credible spirit session that avoids making the séance too neat, quick, or fake. When it comes to tension and fearful moments, the amount of suspense an audience finds in “I Am ZoZo” directly correlates to how much stock they put in spirits and Ouija boards to begin with. No matter how creepy the portrayal is, the unavoidable fact is that a scene with a Ouija board is rarely more than a scene of five people sitting around a table. Use of the board should be the gateway device for delivering substantial scares, and “I Am ZoZo” drops this ball. The movie steps backwards by taking a break after the first Zozo encounter for a day of fishing, frolicking, and friendly chatting with the five friends. This is the type of expository scene that should be part of the buildup, not the denouement. “I Am ZoZo” has its foot on the brake when it should be on the accelerator. This mistake is repeated too often. Instead of capitalizing on established atmosphere, the film meanders with unimportant montages set to operatic arias and cello solos. Another scene of dinner preparation accompanied by an acoustic singer-songwriter soundtrack is similarly misplaced and unnecessary. “I Am ZoZo” starts on a solid track, but the material does not possess the depth to be a noteworthy horror film. A promising premise is undone by a limp latter half that coasts downhill to an underwhelming finale. There are compelling aspects about “ZoZo” when considering it as a small indie production. Yet the bottom line is that it needed a more liberal use of scissors in the editing room, and too many freshman filmmaking choices limit the movie’s potential for effectiveness before it even leaves the starting gate. November 20, 2013 by Ian Sedensky.